In listing all of Lancaster's great qualities, I would be remiss in skipping over a local favorite, Central Market. Heralded as the country's oldest farmers' market, it can be found in a 120 year old building that is packed to the brim with area farmers and venders selling fresh produce, homemade breads and pastries, tasty jams and jellies, homespun crafts, aromatic coffees and teas, local meats and cheeses, and vibrant fresh flowers. Three days a week and year-round, locals flock to their beloved market, filling their bags with goodies and stopping to chat with friends and neighbors. When my sister and I stopped by Market on the bright and sunny Saturday morning of my trip, I was determined to stock up on fresh fruits and veggies to take back to Northern Virginia with me. If I hadn't been limited by how much I could fit in my arms, I could have bought one of everything. Cantaloupe (big ones...for $1 each! ), zucchini and yellow squash, green and red peppers, tomatoes...and eggplant. A produce treasure chest! Once home, I knew I wanted to do something special with the eggplant. Remembering a recipe from one of my favorite cookbooks that I had once made in medical school, I knew exactly what that finished dish would be. Place a rimmed baking sheet in the oven and preheat to 400°. 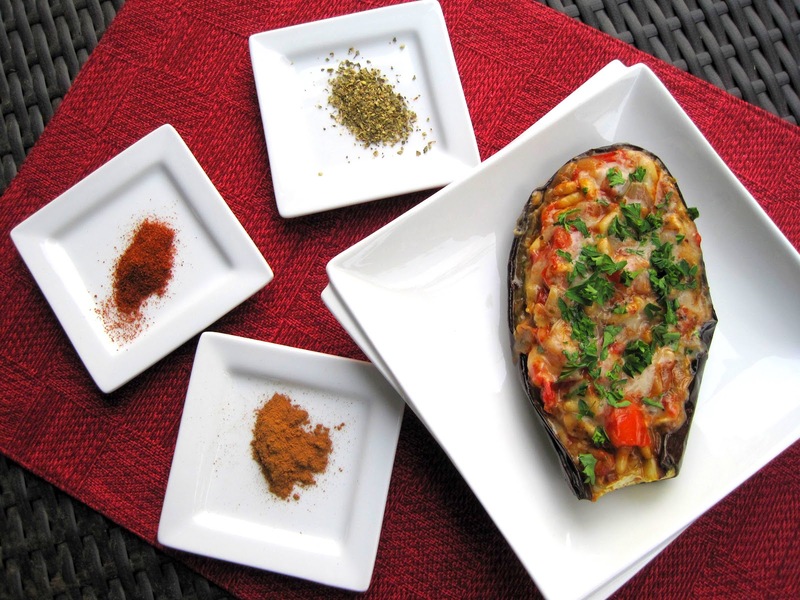 Brush the cut sides of the eggplant with 2 tbsp of the oil and season with salt and pepper. Set the eggplant cut side down on the hot baking sheet and, using oven mitts, carefully cover with foil. Roast until the eggplant is golden brown and tender, 50-55 minutes. Carefully transfer the eggplant to a paper towel-lined baking sheet and let drain. Do not turn off the oven. Meanwhile, heat the remaining 2 tbsp oil in a 12-inch skillet over medium heat until shimmering. Add the onion and 1/2 tsp salt and cook until softened and browned, about 10 minutes. Stir in the garlic, oregano, cinnamon, and cayenne and cook until fragrant, about 30 seconds. Stir in the tomatoes, 3/4 cup of the cheese, nuts, and vinegar and cook until warmed through, about 1 minute. Season with salt and pepper to taste and set aside. Sprinkle with the remaining 1/4 cup cheese and bake until the cheese is melted, 5-10 minutes. (If refrigerated, increase the baking time to 8-12 minutes.) Sprinkle with the parsley and serve warm or at room temperature. *I actually only had Gruyère on hand and didn't feel like running up to Trader Joe's for the Pecorino, so I substituted...and loved that decision. **I've made it both ways: cooked straight through...and refrigerated for 24 after assembly. It tastes just as good either way.